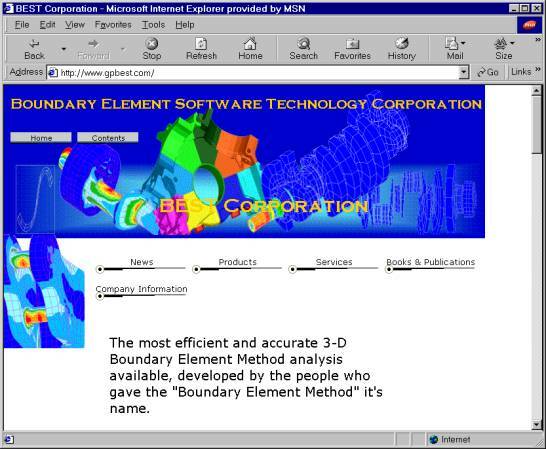 Boundary Element Software Technology Corporation (called Best Corporation, hereafter) reserves the right to make changes in specifications and other information contained in this document without prior notice. Although due care has been taken to present accurate information, Best Corporation DISCLAIMS ALL WARRANTIES WITH RESPECT TO THE CONTENTS OF THIS DOCUMENT (INCLUDING WITHOUT LIMITATION WARRANTIES OF MERCHANTABILITY AND FITNESS FOR A PARTICULAR PURPOSE) EITHER EXPRESSED OR IMPLIED. Best Corporation SHALL NOT BE LIABLE FOR DAMAGES RESULTING FROM ANY ERROR CONTAINED HEREIN, INCLUDING, BUT NOT LIMITED TO, FOR ANY SPECIAL, INCIDENTAL OR CONSEQUENTIAL DAMAGES ARISING OUT OF, OR IN CONNECTION WITH, THE USE OF THIS DOCUMENT. GPBESTä is a trademark of Best Corporation. BESTVIEWä is a trademark of Best Corporation. This software product and its documentation set are copyrighted and all rights are reserved by Best Corporation. Usage of this product is only allowed under the terms set forth in the GPBEST License Agreement. Any reproduction or distribution of this document, in whole or in part, without the prior written consent of Best Corporation is prohibited. 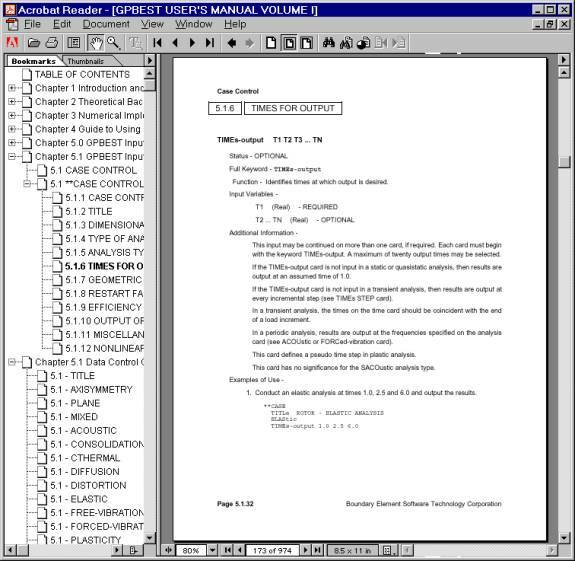 This computer software is submitted with ``restricted rights.'' Use, duplication or disclosure is subject to the restrictions as set forth in NASA FAR SUP 18-52.227-79 (April 1985) ``Commercial Computer Software-Restricted Rights (April 1985).'' Best Corporation, P.O. Box 310, Getzville, NY 14068-0310. If the contract contains the Clause at 18-52.227-74 ``Rights in Data General'' then the ``Alternate III'' clause applies. If you would like to order more copies of this User Manual, please contact the Documentation Coordinator at Best Corporation. U.S.A. orders: All orders must be accompanied by a check or purchase order. Your order will be sent prepaid via UPS or fourth class mail and the shipping charges will be added to the invoice. F.O.B. will be the shipping point. Terms are net amount due within 30 days. Outside U.S.A. orders: Please contact Best Corporation for a quotation. · 90 M DDS Data Cartridge – Instruction for installing GPBEST from this media are located in the GPBEST USER’S MANUAL Volume I, Version 6.0, October 1999, Section 1.2 GPBEST INSTALLATION INSTRUCTIONS. · CDROM – Instructions for installing GPBEST from this media are located in this GPBEST Release Guide, Version 6.0, October 1999, Section 1.1 Installing GPBEST. · Website Download – Instructions for installing GPBEST from this media are located in the Getting Started section of the GPBEST website. GPBEST (total) executable (80,000 d.o.f.). For smaller problems use best-t24 for best efficiency. GPBEST (standard) executable (80,000 d.o.f.). For smaller problems use best-s24 for best efficiency. Short description of GPBEST version contents. Unix shell script, written for the Bourne shell, for starting the Online Manual Viewer. 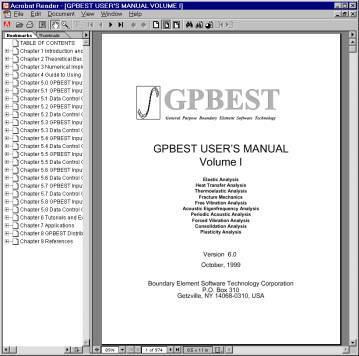 Online Manual file for GPBEST User’s Manual Volume I.
Online Manual file for GPBEST User’s Manual Volume II. 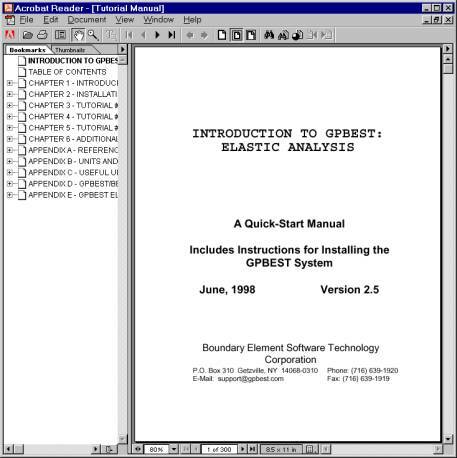 Online Manual file for GPBEST Elastic Tutorial Manual. Contains large and small GPBEST example file data sets and results for a large number of problems. These problems can be used for reference in producing GPBEST data sets. NOTE: The GPBEST example files are delivered in compressed format using gzip. An architecture dependent gzip executable is provided in the GPBEST bin directory for all platforms to uncompress these files. Usage of the gzip executable can be viewed by typing “gzip - -help” on the command line. Main GPBEST-DCE executable for distributed computing environment analyses. Slave GPBEST-DCE executable for distributed computing environment analyses. GPBEST-DCE group functions and communication executable for distributed computing environment analyses. Executable unix shell script sets the DCE_ARCH environment variable to the DCE architecture abbreviation of the executing host for distributed computing environment analyses. Executable shell script which determines the executing hosts architecture for the networking daemon and communication executable. This text file must be customized if GPBEST-DCE installation does not reside in /usr/local/gpbest. Contains large and small GPBEST-DCE example file data sets and results for a large number of problems. These problems can be used for reference in producing GPBEST-DCE data sets. BESTVIEW (Boundary Element Software Technology Viewer) is a graphic pre- and post-processor for generation and viewing of structural models as well as for preparation of input data for subsequent analysis through GPBEST. (non-executable) Colorbar for BESTVIEW. BESTVIEW has a unique coloring scheme. If the user would like to use the traditional colors (red, orange, yellow, green, blue), then include the appropriate COLORBAR in your working directory and select it from within BESTVIEW (see the BESTVIEW manual for details). (non executable) Fonts used in BESTVIEW. 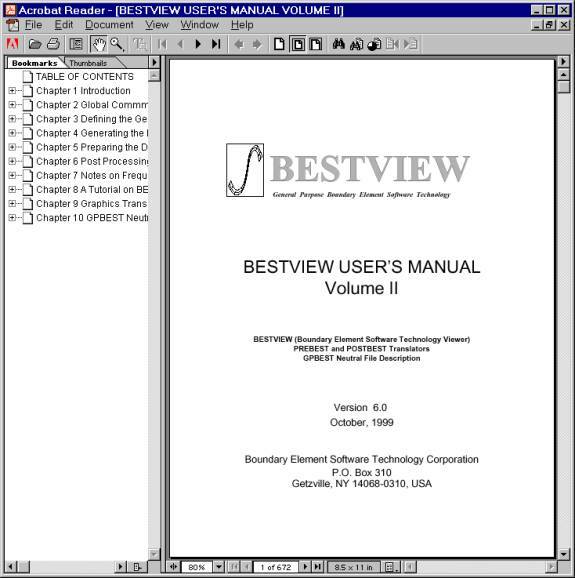 This file lists the fonts used by the BESTVIEW software for displaying the menu and other messages. This file should be placed in the same directory as bestview. GPBEST translator. Translates PATRAN neutral files, I-DEAS universal files, HYPERMESH ASCII neutral files, and FEMAP ASCII neutral files to GPBEST input data files. GPBEST translator. Translates GPBEST neutral file (NEUTRAL.OUT) created during GPBEST execution to a PATRAN neutral file or an I-DEAS universal file or a HYPERMESH ASCII neutral file or a FEMAP ASCII neutral file for post processing of GPBEST results. iges executable. iges executable module is used by the BESTVIEW software to import IGES files. The following files are used for GPBEST translator integration with other programs gpb_acou_nod.res_tmpl, gpbest_dis.res_tmpl, gpbest_els.res_tmpl, gpbest_nod.res_tmpl and gpbest_not.res_tmpl. The program files are now installed. NOTE: This assumes that the user places the GPBEST password file in the (Installation directory)\gpbest\bin\WINNT\password directory and names it password. q The online manuals are completely text searchable. q Table of Contents bookmarks are supplied to navigate easily through the Chapters and Sections. q Keyword bookmarks are supplied to easily find GPBEST input keywords. q Thumbnails are supplied to navigate quickly through manuals. To view the online manuals use the latest version of Adobe Acrobat Reader. As you can see, the bookmarks are located on the left and a full-page view on the right. This is the default display for all of the GPBEST online manuals. 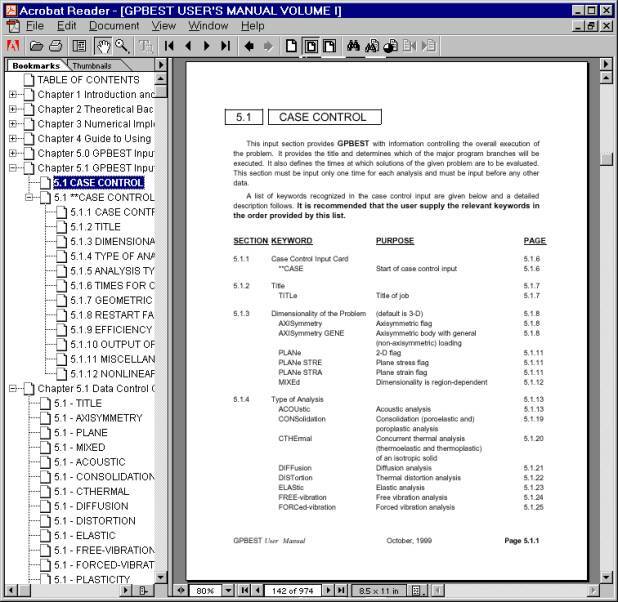 By clicking on the Table of Contents bookmark with the left mouse button the GPBEST User’s Manual Volume I page appears. 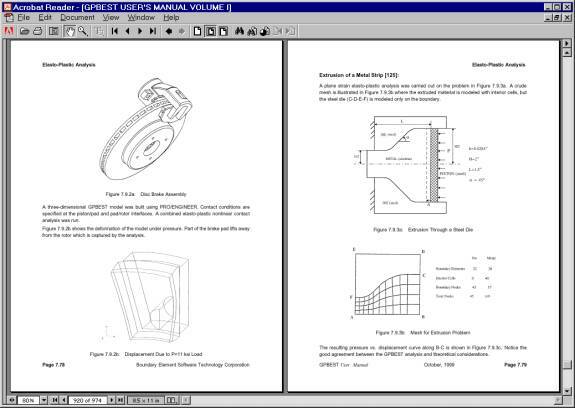 This page, like many other pages in the manual, is also hyperlinked to all the Chapters and Sections of the manual. Within the viewer, an open hand represents the default cursor or pointer. As you move the hand around the page, it will change to a pointed finger over certain areas of text. This change in the hand indicates a hyperlink. If the pointed finger is clicked, you are transported to the hyperlinks destination. 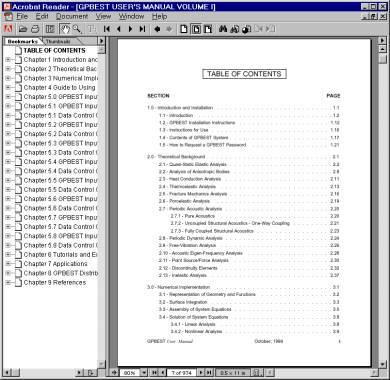 As in the following example, if you click on the text “1.0” on the Table of Contents page, you will be moved to the “1.0 Introduction and Installation” page. To return to the page where you clicked on the hyperlink, use the right mouse button and select “Go Back”. Selecting the bar between the bookmarks and page view can expand the bookmark window. Use the left mouse button to select the bar and drag it to the right. Expanding the bookmark outline for Chapter 5.1, we can see several helpful links for the Chapters, Sections and keywords of GPBEST input. Another very useful function now available for all of the GPBEST manuals is full text searching. At the top menu bar there is an icon of binoculars. Left click on this icon and type in a search phrase. For an example, we will look for all places where the text “TIMEs-output” occurs. After executing this search several times, we find the text we were searching for. Of course, to find this keyword page, we could have just clicked on the appropriate bookmark. If you wish to go to a specific page number, change the page view or backtrack through the pages you have seen, these functions and many more are located in the pull down menus at the top of the viewer under “View”. One final view is the thumbnails. These are particularly helpful to the user who is very familiar with the GPBEST Manuals and wants to flip through the pages as though they were using a hard copy manual. Clicking the third icon from the left at the top of the viewer removes the bookmark view and shows the thumbnail view. 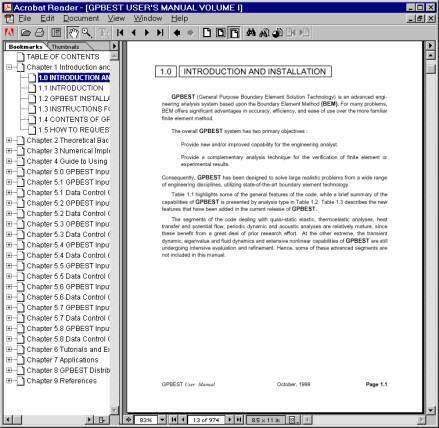 Expanding this view, the user can look at many pages and find the appropriate section in the manual by sight rather than page or section number (this makes it easy to find many of the graphics in the GPBEST manuals). Many other page views are available to search and view all of the GPBEST manuals. The startup screen for the other GPBEST manuals. The following sections instruct the user on where to get help and what sources of information are available for the GPBEST, GPBEST-DCE, BESTVIEW and TRANSLATOR system. This system was designed to give the user quick access to the information needed in developing complex engineering analyses for the GPBEST system. All of the GPBEST hard copy manuals are available on-line and are text-searchable. Also, extensive bookmarks and keyword hyperlinking are applied to each manual to aid the user in finding and navigating through the GPBEST documentation. Please refer to Section 1.2 Version 6.0 Documentation and Online Manuals for further information.